In late summer 2015, Sydney Hodge was working at an Urban Outfitters in Tysons Corner. She had dropped out of Virginia Tech nearly two years earlier and was “pretty set” on staying in retail. But her parents kept bugging her about college, and urged her to look into Sweet Briar. Hodge quit her job the next day and started making plans to move to the small women’s college in the foothills of the Blue Ridge Mountains for the fall 2015 semester — the best choice she has ever made, she says. Sydney Hodge ’17 at NAFASI in Arlington, Va. 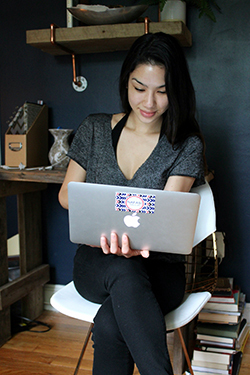 The business major is back in her neck of the woods this summer for an internship she found online: project manager at NAFASI, a small, residential interior design company in Arlington. Hodge isn’t sure exactly what industry she wants to work in after college. She’s always gravitated toward creative and design-oriented fields, but is also discovering an interest in management.